Oh, we are getting to the home stretch now! First, two sleeves to seam up. Why work the sleeves flat and seam? 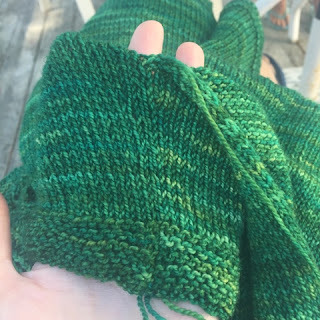 I'm just being extra-finicky here and knit the sleeves flat to make sure there was no difference in gauge between the sleeves and the body. If this weren't a very special sweater, I might have worked the sleeves in the round. 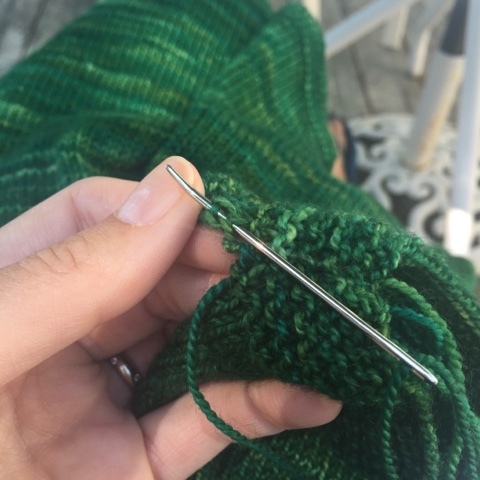 Then again, I might have done it the same way, since my speed knitting vs. purling is very similar. Now, whether that's because I'm a thrower/English knitter or because I learned to purl right away after learning to knit, I don't know. It is my understanding that pickers/Continental knitters tend to work the knit stitch more quickly. And then there are knitters who learn the knit stitch first and perfect that before they learn to purl, which leads to purling being more awkward for them. When I am sewing up seams, I use mattress stitch. It works so well for connecting the sides of things. As you can see above, I take the tapestry needle under two stitch bars on one side. And then (not pictured), I pull the tapestry needle through the corresponding bars on the other side. This is also the reason why I work sleeve increases a couple of stitches in from the edges of the work: it is more difficult to pick up the bars in the increase column of stitches (at least it is for me). And here is how the sleeve looks part-way through seaming. So tidy, and you can hardly tell where the join is. Next step: The "dreaded" Kitchener stitch.